With a view to creating opportunities for promotion and marketing of products produced by entrepreneurs, Palli Karma-Sahayak Foundation (PKSF) has taken an initiative to construct a 13-storey “PKSF Display & Sales Centre” on its own land in Shyamoli at the heart of the capital. On 4 February 2018, PKSF Deputy Managing Director (Administration) Dr. Md. 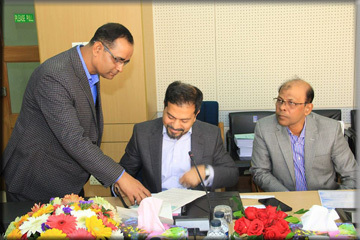 Jashim Uddin and the Managing Director of Concord Engineers and Construction Ltd, Mr. Shahriar Kamal, signed the agreement for construction of the building on behalf of their respective organizations. Mr. Md. Abdul Karim, Managing Director of PKSF, and other senior officials of PKSF and Concord Engineers and Construction Ltd. were present at the agreement signing ceremony held at PKSF Bhaban in Agargaon, Dhaka. The Bureau of Research Testing and Consultation of Bangladesh University of Engineering and Technology (BUET) will supervise the construction works in the capacity of consultants. The foundation stone of the building was laid on 25 March 2017 by the Chairman of PKSF, Dr. Qazi Kholiquzzaman Ahmad.